Know an #eduHero that you would like to nominate for a CUE Award? Login to judgify, and celebrate! 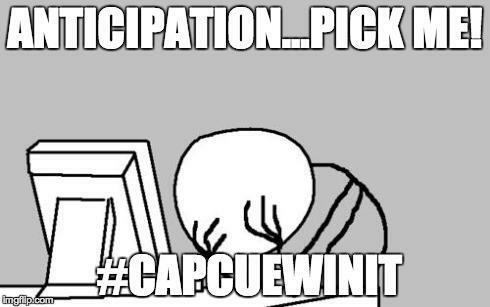 for the meme she tweeted out in the CapCUE twitter contest 'Why should you go to RockStar Tahoe?' She will receive a free registration to the sold out RockStar Tahoe event on July 6th, 7th, & 8th. CapCUE is the hosting affiliate of CUE at this RockStar camp. Don't miss out on a RockStar camp experience this summer. Go to http://www.cue.org/rockstar today and register for a Rockstar camp today. The following CUE awards are nominated by the affiliate. NOTE: Deadline to submit nominees to your local CUE Affiliate: Nov. 15. Technology in Learning Leadership Awards recognize local, state and national leaders in educational technology. Members of the broader educational technology community (not necessarily members of CUE) are eligible for recognition in this category for their contributions to advancing the mission of the organization. Nominations for this category are submitted through each local CUE affiliate. Unless ineligible, award winner will become CUE's nominee for the ISTE Technology In Learning Award. Two-page overview of the nominee's leadership contributions addressing the use of educational technology on an ongoing basis. Name added to perpetual plaque in CUE's Hall Of Fame. The Outstanding Teacher Award recognizes a classroom teacher who has made a noteworthy contribution to educational technology in a classroom setting. Creating standards-based curriculum using technology is the key element in this award. Nominees must be classroom teachers and CUE members in good standing. Nominations for this category are submitted through each local CUE affiliate. Unless ineligible, award winner will become CUE's nominee for the ISTE Outstanding Teacher Award. Two-page overview of the nominee's contributions to educational technology in a classroom setting and how the nominee uses technology to support standards-based curriculum on an ongoing basis. A 300 dpi headshot (maximum 2MB)﻿. The Computer-Using Educator (CUE) Outstanding Emerging Teacher award recognizes a classroom teacher who in the first 7 years of their teaching career has already made a noteworthy contribution to educational technology in a classroom setting. Using technology to support standards-based curriculum is the key element in this award. Nominees must be classroom teachers and CUE members in good standing. Award winner will become CUE's nominee for the International Society for Technology in Education (ISTE) Outstanding Young Educator Award, unless ineligible as per ISTE's requirements. Letter of support from principal or direct supervisor including how many years the candidate has been teaching (no more than 7 years). An additional (optional) letter of support from a colleague. A 300 dpi headshot. (maximum 2MB). • Creativity and innovation in dealing with issues and problems facing education. Nominations for this category can be submitted by CUE members (all categories), CUE affiliates, SIGs, CUE Committees, the Board of Directors, and staff members. Two-page overview of the nominee’s noteworthy contributions to promoting educational technology within his/her school on an ongoing basis. Please refer to criteria for selection on attached page. Letters of Support (1) — must be from a teacher who has worked with the nominee. Please state this relationship explicitly in the first paragraph. Letter of Support (1) – Additional letter of support.